The Yale School of Music presents the Linden String Quartet, its graduate quartet-in-residence, in concert on Monday, October 31 at 8 pm. The ensemble, which has won several prestigious honors and accolades in only three years together, will perform music by Schubert, Ravel, Alban Berg, and Kelly-Marie Murphy. This concert will open with Schubert’s Quartettsatz in C minor, which was not published until after the composer’s death, and Berg’s two-movement String Quartet, Op. 3, written exactly 90 years later. The first half will close with Kelly-Marie Murphy’s Dark Energy. This single-movement piece explores the idea of dark energy, an antigravity force that Einstein suggested in 1917 as a way of explaining why the universe doesn’t collapse. The work is both melodic and virtuosic, beginning softly and gaining momentum. Ravel’s lush and complex String Quartet in F major will conclude the concert. The Yale School of Music features the music of two of its faculty composers in a New Music New Haven concert on Thursday, November 3, 2011. Guest performers, including the Double Entendre music ensemble and violinist Todd Reynolds, will perform works by faculty composers Martin Bresnick and Ingram Marshall. The concert will also include music by students in the School’s prestigious composition program. Ingram Marshall’s “September Canons” for violin and electronics will be performed by soloist Todd Reynolds. Marshall’s music has been described as having “a quality of timeless lament, of inconsolable sorrow.” This piece is a meditation on the events of September 11, 2001. Martin Bresnick’s “Going Home (Vysoke, My Jerusalem)” will be performed by Double Entendre, an ensemble comprising Christa Robinson, oboe; Yuki Numata, violin; Erin Wight, viola; and Brian Snow, cello. Bresnick, a serious oboist for many years, began writing the piece as a musical homecoming and found himself incorporating memories of his family’s former home in the Russian-Polish town of Vysoke. The Ellington Jazz Series at the Yale School of Music kicks off its 2011–2012 season on Friday, November 4 with a concert featuring French horn player Willie Ruff and the star drum quartet The Whole Drum Truth. Multistyle violinist Mari Black will also perform. The concert will begin at 8 pm at Morse Recital Hall in Sprague Memorial Hall (470 College Street, New Haven). The Whole Drum Truth is a quartet of master drummers in modern jazz. Collectively, they have played alongside artists including Herbie Hancock, Duke Ellington, Dizzy Gillespie, Lester Young, Yusef Lateef, Ella Fitzgerald, and Ravi Shankar. Albert “Tootie” Heath, the youngest of the legendary Heath Brothers, leads the quartet. The other members are Louis Hayes, the current leader of the Cannonball Legacy Band; Kenny Washington, who teaches at Juilliard and plays in the Bill Churlap Trio; and Willie Jones III, who has released four albums as a leader on his own label, WJ3 Records. Willie Ruff, the founding director of the Ellington Series, plays both bass and French horn and has performed on the bill with figures such as Louis Armstrong and Count Basie. Mari Black, a graduate of the Yale School of Music and a winner of numerous fiddle and violin competitions, has played concerts from Canada to Korea to Zimbabwe. The Yale School of Music will present a memorial concert for John Miller on Sunday, October 30, at 4 pm in Morse Recital Hall at Sprague Hall. John’s extraordinary contributions to the YSM Music in Schools Initiative will be celebrated musically by students, faculty, and alumni, and a Morse Academy student from the New Haven Public Schools. All are welcome to join the YSM community and members of the Miller family in this memorial tribute. The event is free and open to the public. Memorial donations may be made to the John Miller Instrument Fund for New Haven Public Schools (Office of the Dean, Yale School of Music, P.O. Box 208246, New Haven, Ct, 06520-8246). The Yale School of Music presents the singers of Yale Opera in two evenings of opera scenes on Friday and Saturday, October 28 and 29. Each evening will feature a different selection of scenes from popular operas by composers as diverse as Handel, Gounod, Puccini, and more. Both performances will take place at 7:30 pm in Morse Recital Hall, located in Sprague Hall (470 College Street, corner of Wall Street). A favorite of local audiences, the annual Fall Opera Scenes production showcases the creative talents of artistic director Doris Yarick Cross and stage director Marc Verzatt. This autumn’s production will also feature visual projections designed by students in the Yale School of Drama’s program in projection design. The projection program is directed by Wendall K. Harrington, and here each scene will incorporate the work of a different design student. The creative team also includes costume designer John Carver Sullivan, lighting designer William Warfel, and musical directors Douglas Dickson and Timothy Shaindlin. The singers are all students in the renowned Yale Opera program. 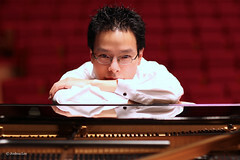 The Yale School of Music presents the Hong Kong-born pianist Wing-Chong Kam in a Doctor of Musical Arts recital on Thursday, October 20, 2011. Kam will perform music of Mozart, Brahms, Chopin, and Debussy. His recital will take place at 8 pm in Morse Recital Hall, located in Sprague Hall at 470 College Street (corner of Wall Street). Musical fantasies will frame the program: Mozart’s Fantasie in D minor, K. 397 will open the concert, and Chopin’s Fantasie in F minor, Op. 49 will close it. Born in Hong Kong, Wing-Chong Kam is an active solo and collaborative pianist. Since his first public concert in Hong Kong at the age of ten, he has performed in many local and international festivals including the Carinthia Summer Festival, International Holland Music Sessions, TCU/Cliburn Piano Institute, and the Aspen Music Festival. Kam’s orchestral collaborations have included the Queensland Philharmonic, Hartford Symphony Orchestra, Hong Kong Philharmonic, and Hong Kong Sinfonietta. Recently he premiered Eduard Schütt’s Paraphrase for Piano Left Hand and Orchestra with the Hong Kong Philharmonic. A recipient of numerous prizes and awards, Kam has studied with pianists and pedagogues Eleanor Wong and Boris Berman. He is now an adjunct teaching faculty member of the Hong Kong Academy for Performing Arts and Hong Kong Summer Music. Since 2008, he has given master classes and lectures, and has served as an adjudicator for competitions in Hong Kong, Macau, and China.